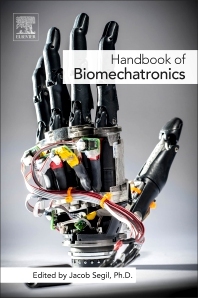 Handbook of Biomechatronics provides an introduction to biomechatronic design as well as in-depth explanations of some of the most exciting and ground-breaking biomechatronic devices in the world today. Edited by Dr. Jacob Segil and written by a team of biomechatronics experts, the work begins with broad topics concerning biomechatronic design and components, followed by more detailed discussions of specific biomechatronic devices spanning many disciplines. Dr. Jacob Segil currently holds a dual appointment with the Engineering Plus Program at the University of Colorado Boulder and with the Denver Veterans Administration Medical Campus. Dr. Segil researches brain-machine interfaces specifically in the design and control of upper limb prosthetic devices. In 2016, he was awarded an early career award from the Rehabilitation Research and Development division of the Department of Veteran Affairs in order to study the restoration of sensory feedback in multi-functional prosthetic hands. Previously, Dr. Segil received his doctoral and master degrees in the Mechanical Engineering department at the University of Colorado at Boulder under the supervision of Dr. Richard Weir after working at the Center for Bionic Medicine at the Rehabilitation Institute of Chicago.